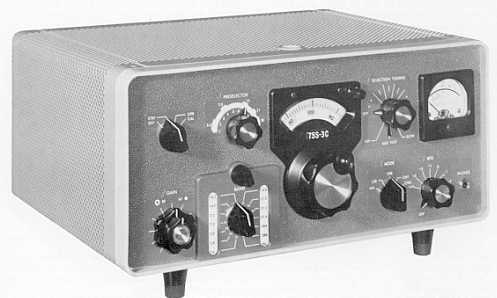 The Collins 75S-3C is a versatile receiver with exceptionally sharp selectivity and operation in any of its four modes: SSB, CW, AM, and RTTY. For AM reception the passband can be optimized by the installation of an optional 3.1 kHz, 4.0 kHz, or 6.0 kHz Mechanical Filter. Two CW mode switch positions offer up to three degrees of selectivity in the CW/SSB function through use of optional plug-in filters. The 75S-3C Receiver can be combined with the 32S-3A Transmitter and 312B-4 Station Control to make a completely integrated station. The 75S-3C, when used with the 32S-3A, is capable of transceiver type operation with the receiver PTO controlling the transmitting frequency. The 75S-3C is also compatible with the Collins KWS-1, KWM-1, KWM-2, and KWM-2A Transceivers. Coverage outside the amateur bands, or additional 10 meter coverage, can be obtained by plugging in the appropriate crystals. Pitch for CW reception can be varied by turning the BFO control on and adjusting it for the most pleasing beat note, while the desired signal is centered in the filter passband. The calibration marks can be used to shift from high mark to low mark when copying RTTY. When the BFO knob pointer is at the 0 reference mark, the BFO frequency is approximately the same as crystal BFO in USB position. With the knob in the off position, the crystal BFO is in operation. RTTY operation requires a conventional converter and printer. Fine tuning in this mode is easy with the variable BFO. 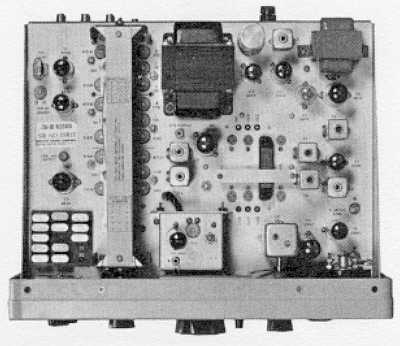 The 75S-3C provides two HF crystal boards. A board for general coverage crystals is located on the top of the chassis, and the standard group of amateur band crystals is mounted in a board on the underside of the chassis. Frequencies near range edges may require trimmer readjustment for proper operation. 80 meters: 3.4 - 3.6 MHz, 3.6 - 3.8 MHz and 3.8 - 4.0 MHz. WWV: 14.8 - 15.0 MHz. 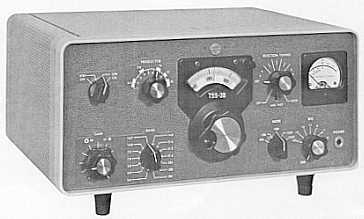 15 meters: 21.0 - 21.2 MHz, 21.2 - 21.4 MHz and 21.4 - 21.6 MHz. With optional crystals, any 200 kHz range can he tuned from 3.4 to 30.0 MHz (except 5.0 to 6.5 MHz). Selectable USB, LSB, CW or AM. Selectable single sideband, CW, RTTY and AM, continuous. 115/230 vac, 50-400 Hz. Power consumption is approximately 85 watts. Power can be provided by an external supply which delivers 185 vdc at 125 ma and -62 vdc at 5 ma. Filament power can be ac or dc as follows: 6-7 v at 5.5 amps, 12-14 v at 2.75 amps or 24-28 v at 1.4 amps. Image rejection better than 50 db. Internal spurious signals below 1 uv equivalent antenna input. Not less than 40 db below 1 watt. Within 100 Hz during any one-hour period following 20-minute warm-up. Not more than 100 Hz with 10% line voltage variation. 0.5 uv for 10 db signal-plus-noise-to-noise ratio in SSB mode. SSB: 2.1 kHz, 2:1 shape factor. CW: two switch positions and sockets; no filters supplied. AM: 5 kHz. Optional filters for 0.2, 0.5, 0.8, 1.5, 3.1, 4.0 or 6.0 kHz are available. AGC threshold: 1.5-3.0 uv, 1.5 nominal. Selectable AGC time constant, Fast, Slow and Off. Attack time is 1 millisecond in both Fast and Slow. Fast release time is 190 milliseconds. Slow release time is 600 milliseconds. Audio output level does not change more than 15 db as the input signal is changed from 10 uv to 100,000 uv. 1 watt at AGC threshold, 3 watts maximum. Speaker: 3-4 ohms. Headphones: 500 ohms or higher. Not more than 10% at 1 watt. Jack on rear apron requires ground-on-receive information from transmitter. 1 amp SB fuse in ac line. Receiver with feet: 14 3/4" W, 7 3/4" H, 12 1/2" D (37.47 cm W, 19.69 cm H, 31.75 cm D).